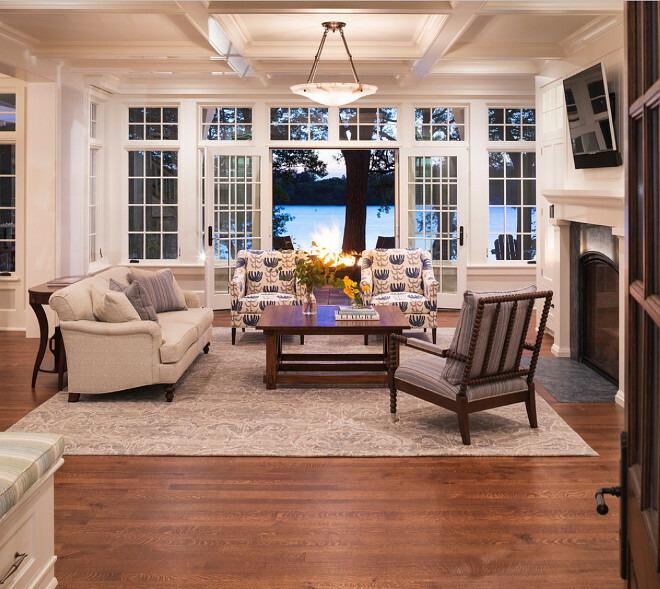 Built by the very talented John Kraemer & Sons and architecturally designed by Swan Architecture this lake house is full of charm and interior ideas. 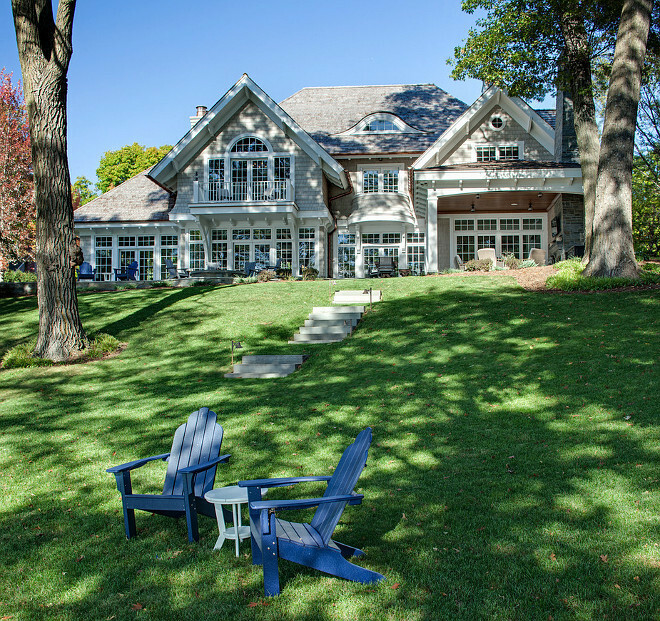 With a classic coastal feel, this new Shingle-Style residence on Lake Minnetonka, only about 15 miles from Minneapolis, Minnesota, serves as a home away from home for a family of four. 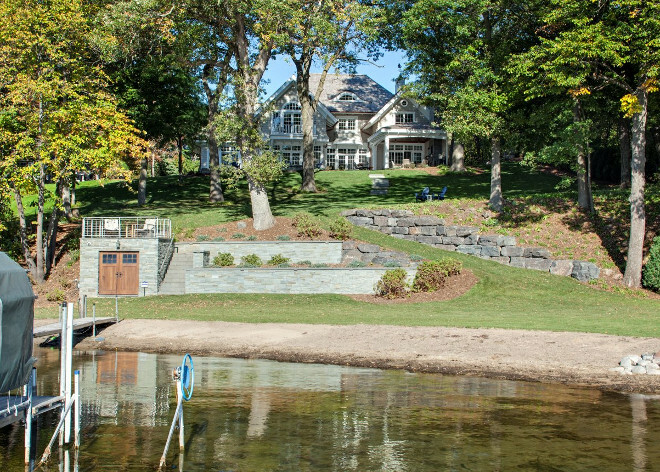 This current destination for seasonal recreation will eventually transition to a relaxing primary residence for the parents and I’m proud to share its timeless beauty with you today. This lake house is surrounded by natural beauty. The exterior stone is a standard blend of Bluestone veneer offered by Orijin Stone. A charming basement garage\shed is located on the side of the house. Notice the beautiful combination of stone and shingles. The roof is Cedar as well as the siding. 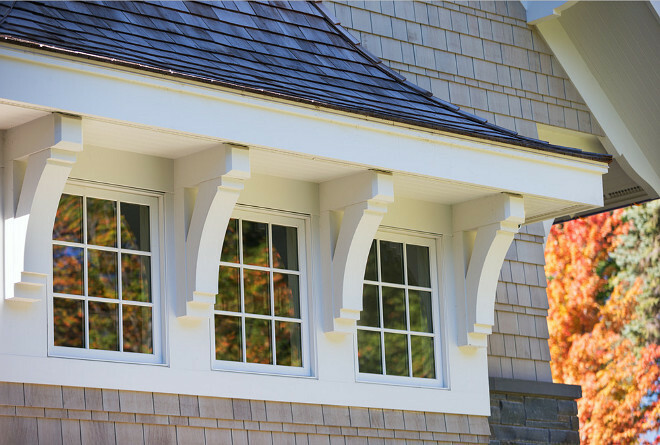 Exterior Trim Paint Color: Benjamin Moore OC-21 Winter White. The pre-stained siding color is “Foghorn” by Cabot. 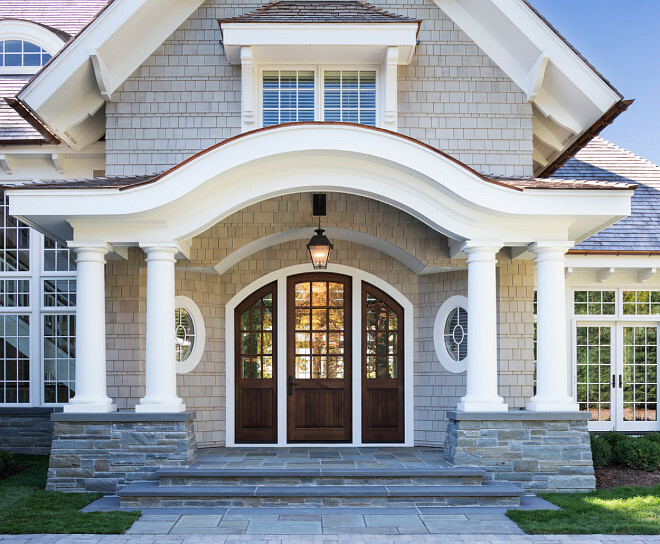 The front door was custom made by Great Northern Door Company in MN. 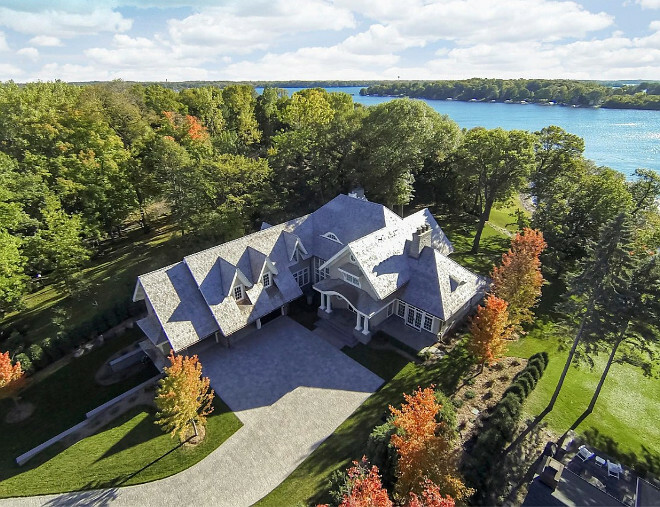 This home was built to embrace the stunning lake views. 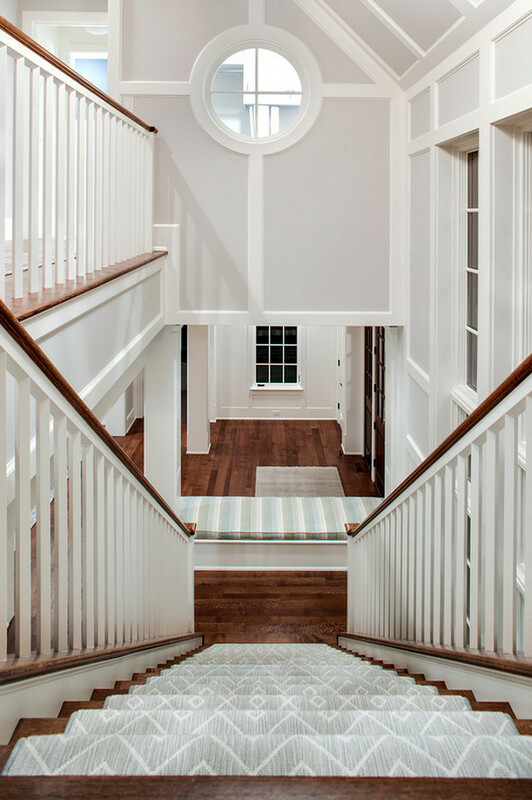 Built-ins, trim and ceiling are painted in White Dove by Benjamin Moore. Windows and doors are Marvin Ultimate Windows and Doors. The layout of this home is open yet distinct. Notice the dining room cabinet and the beautiful lighting. The dining room opens directly to the kitchen. 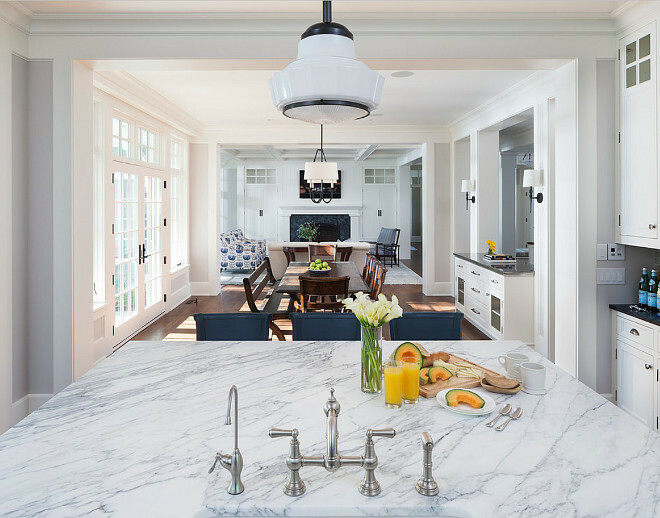 The island features carrara marble countertop, brushed nickel faucet and a schoolhouse pendant light. This kitchen is timeless without being too serious. 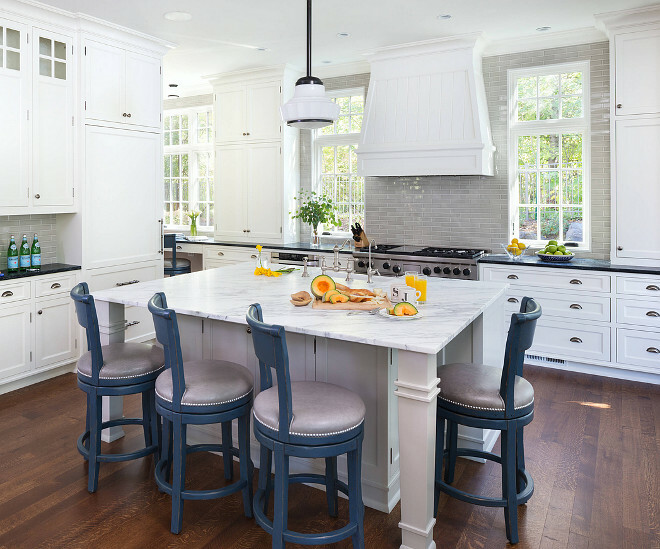 I’m loving the blue barstools and the light gray island. The backsplash is 2×8 Gray Ceramic Subway Tiles. There’s plenty of storage and counter space in this kitchen. Notice the kitchen desk and butler’s pantry. 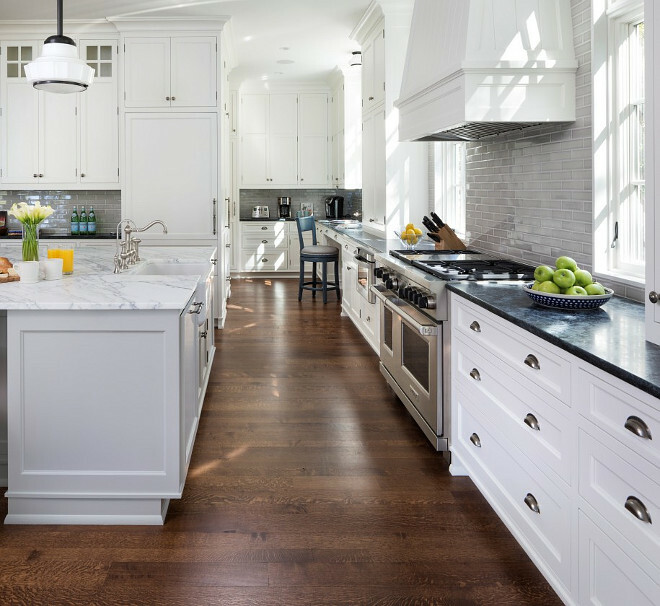 Carrara marble was used on the island and black granite was added to the perimeter cabinets. Isn’t this bathroom cute? The wallpaper is Scion Dragonfly Wallpaper NMEL110246 Indigo, Peacock and Chalk. 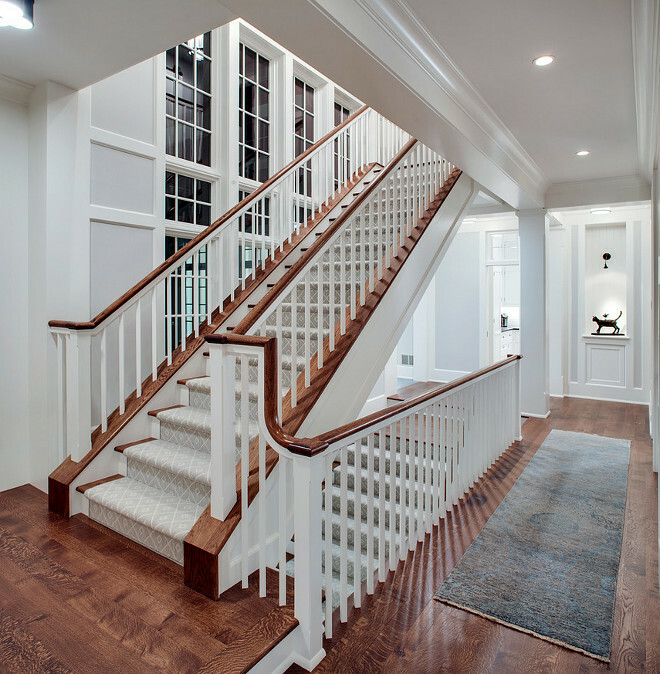 I’m loving architectural details of this stairway and the gorgeous pale gray runner. 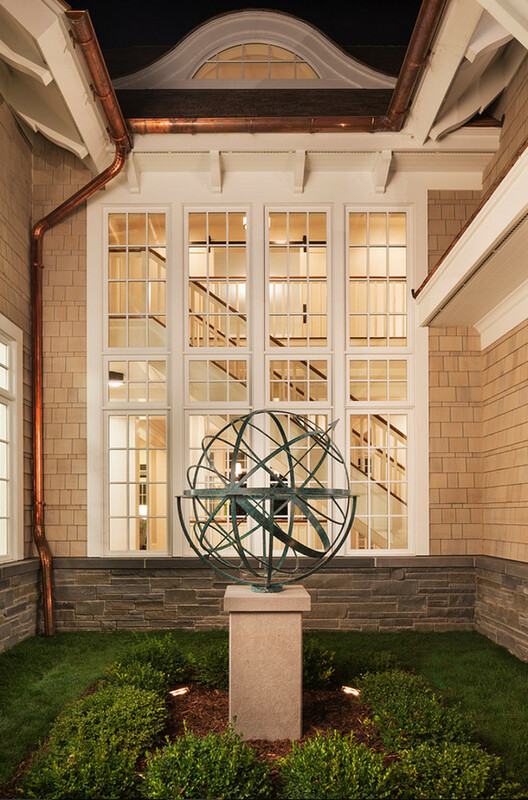 A circular window brings a coastal and airy feel to the foyer. Notice the built-in bench by the front door. 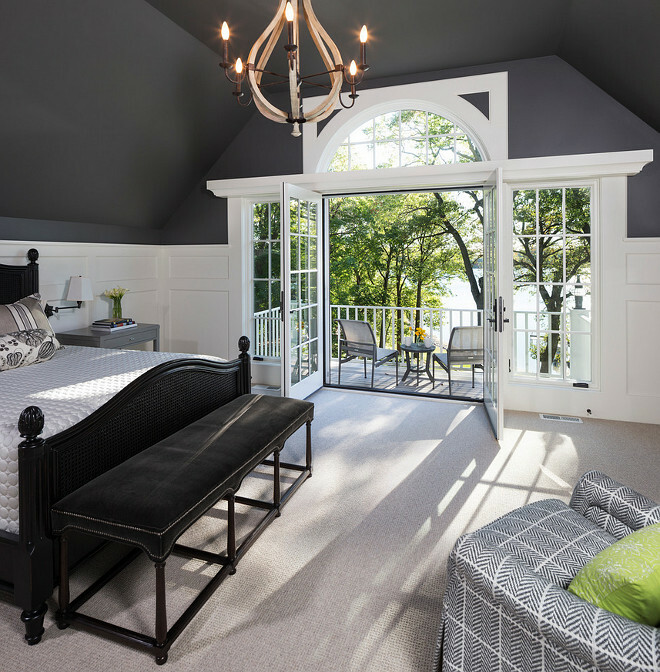 This master bedroom is simply stunning! Paint color is Iron Mountain by Benjamin Moore. 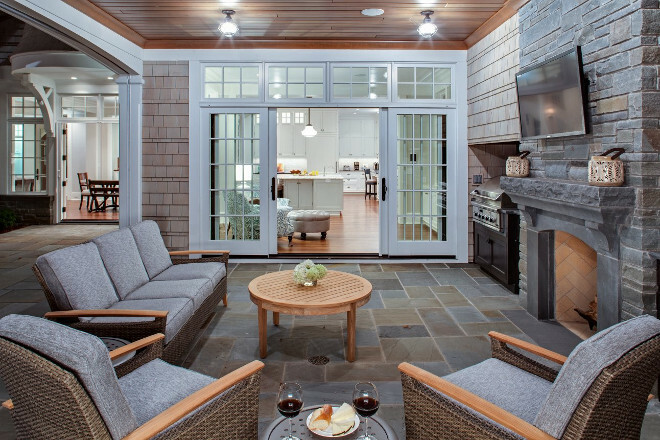 The sunroom features a floor-to-ceiling stone fireplace and French doors that easily bring the outdoors in. Lighting is Darlana Lantern in Aged Iron. 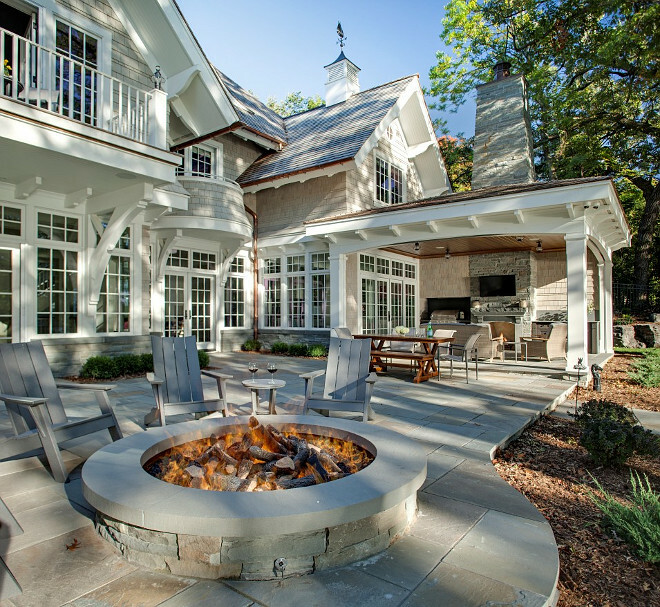 The backyard of this house features a large stone patio with fire pit, outdoor fireplace and an outdoor kitchen. 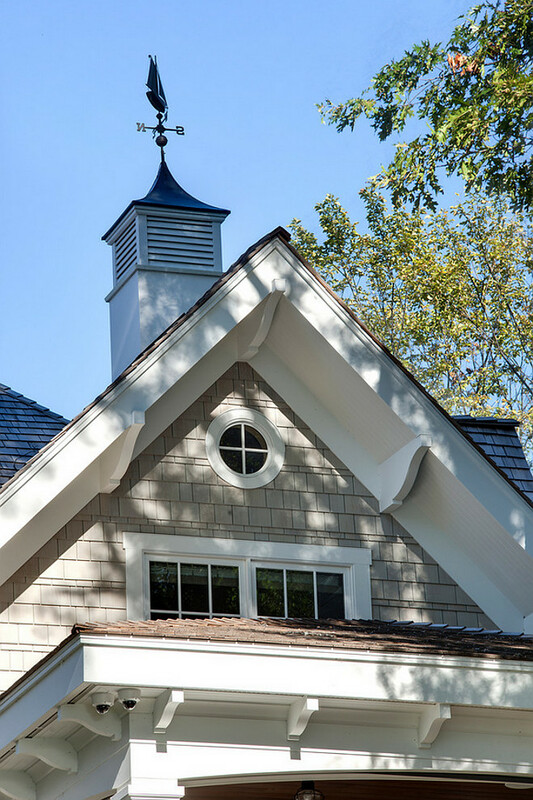 Like every coastal home should, this one has a charming weathervane. 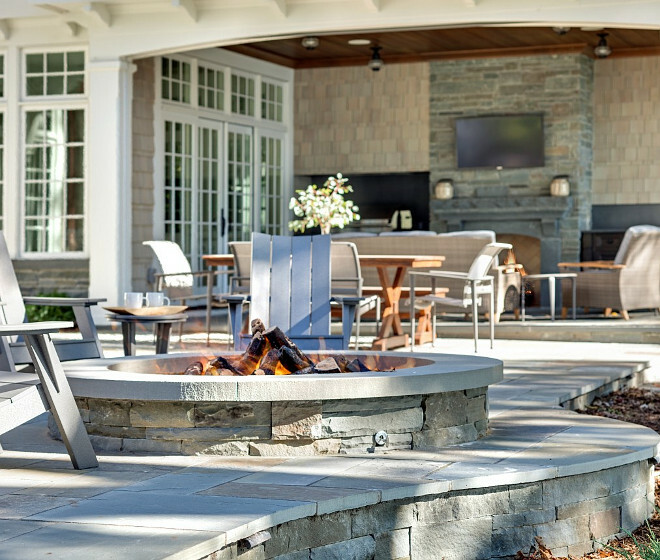 The built-in fire pit is made of natural Bluestone. 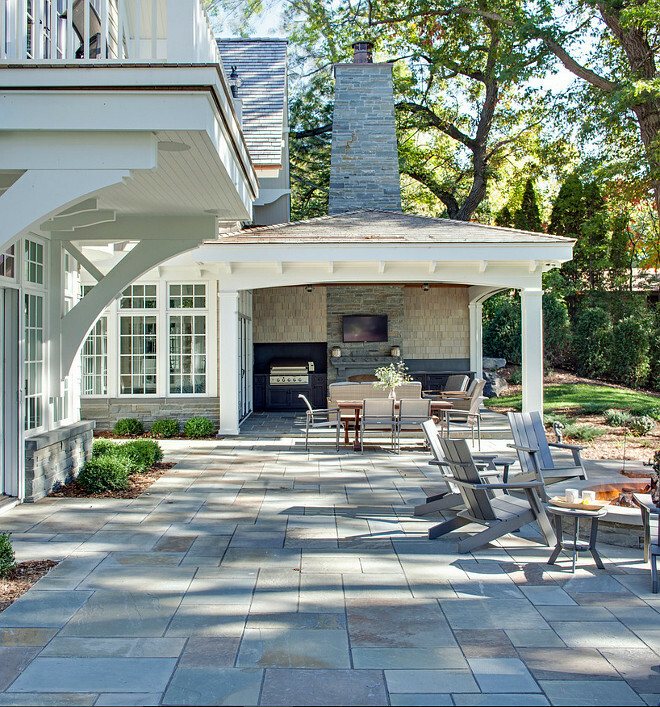 The stunning patio is also made of natural Bluestone. The covered patio features motorized screens by Phantom Screens. Dining area – the chairs are Brown Jordan Flight collection. The sofa and chairs are from Gloster Pepper Marsh Collection. I love how private and peaceful this property feels. Notice the dock and boat shed with rooftop. 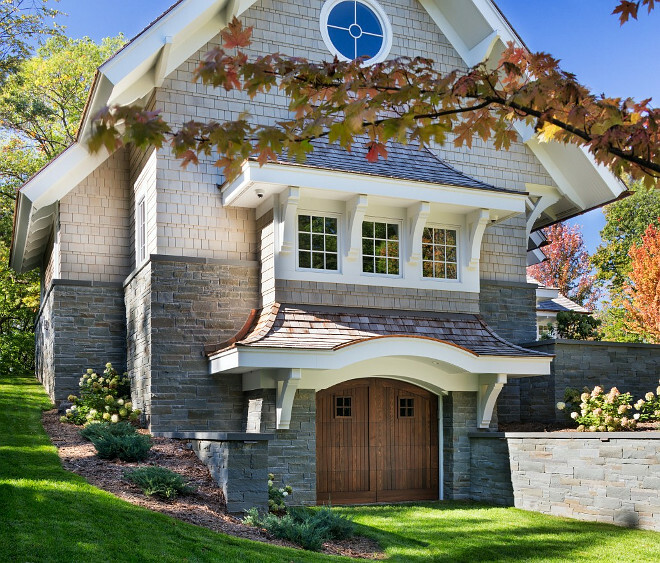 The exterior of this home features pre-stained gray shingles, Bluestone and copper gutters. Stone was added even to the sides of the patio. Notice the lighting as well. 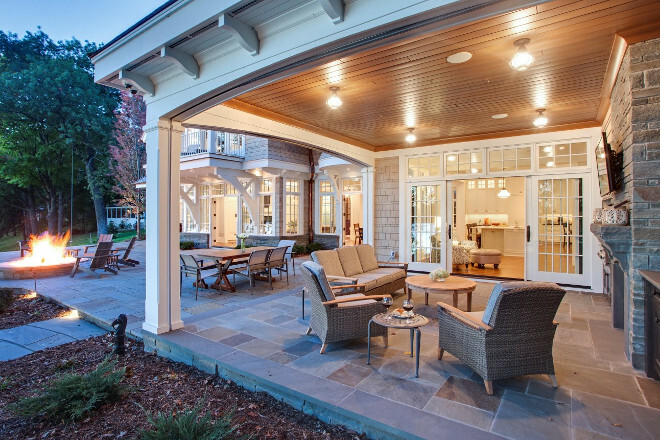 This is an inspiring patio layout. 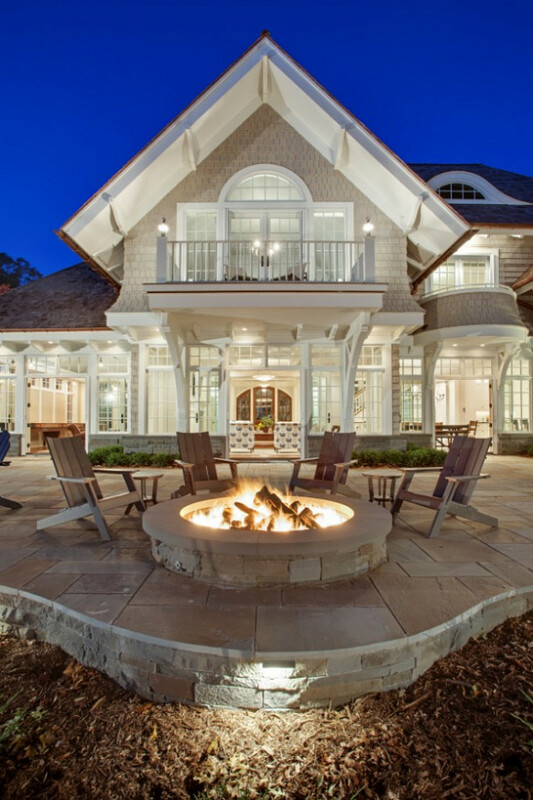 I like the idea of having a cozy covered patio with fireplace and a more spacious dining area with fire pit. Good moment are even better when shared. Hi, my wonderful friends! I missed being here! Did you guys have a happy Thanksgiving? I hope you had a great time and ate lots of delicious food! With that in mind, expect to see plenty of Christmas Decor posts around here. I can’t wait to start sharing them with you! Thank you all for being here today and I truly wish you a Blessed week, filled with joy, health and love. May you be able to share your love and feel embrace by love and careness. 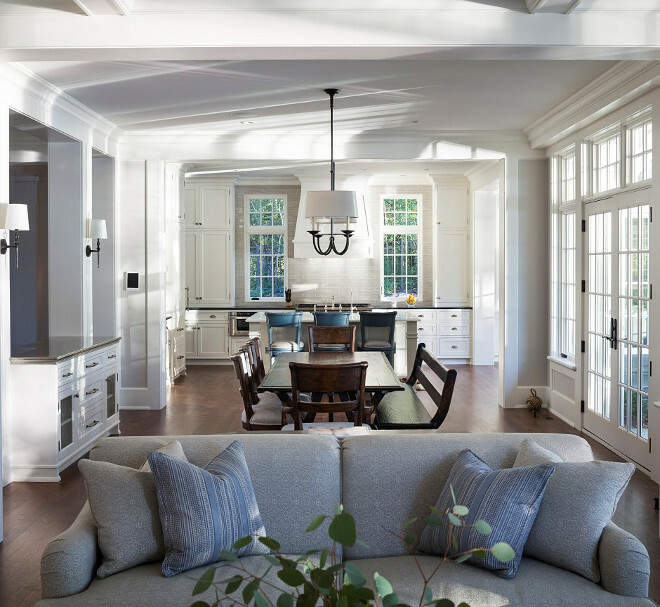 Sources: Builder: John Kraemer & Sons Architect: Swan Architecture Interiors: Katie Redpath Constable. Landscaping: Bechler Landscapes. Photography: Landmark Photography. 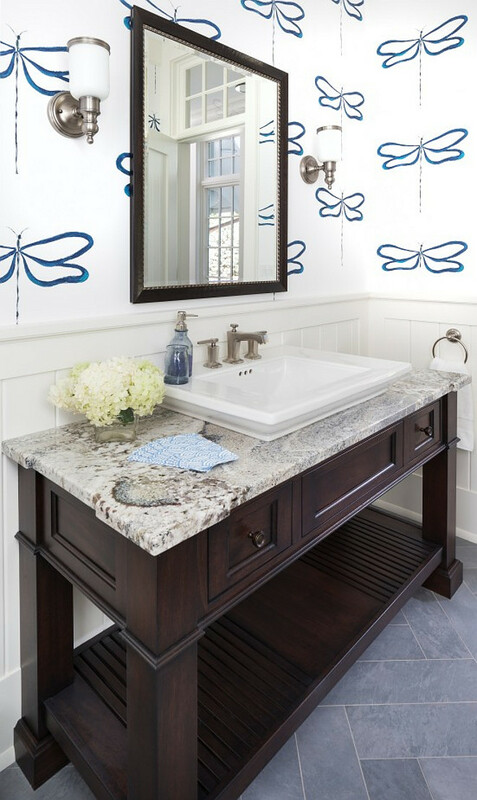 What a great home – I love the kitchen and the bathroom with the dragonfly wallpaper is adorable!! Happy Tuesday, my friend! I’m speechless! Talk about detail! Where can I find the blueprint layout of this home? Unfortunately, I don’t have this information on my files. Please try to contact the designer for more details. Are the house plans for this home available? Would you mind sending me the link for the house plans for this house? We are in the process of buidling our dream cottage and this has a lot of elements I woud like to encorporate. Just wondering if you have the blue prints or house plans etc! Where is the floor plan for this home? Anyone having luck attaining some information? I do not have the floor plan. I recommend you to reach to the designer for more information. What a fabulous home! 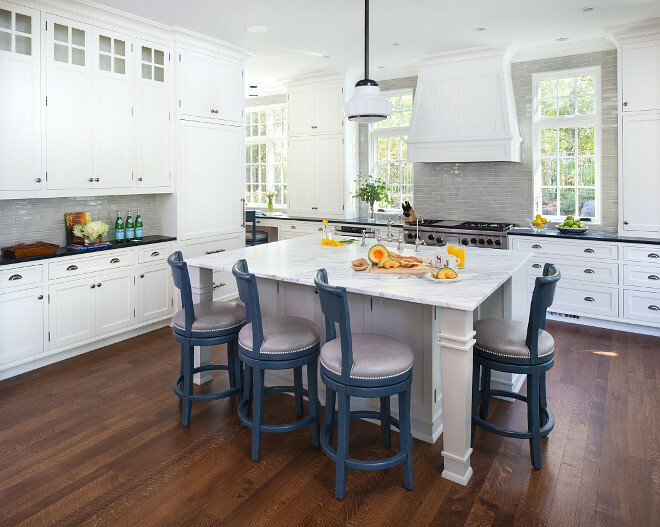 My client was asking what the blue color of the barstools in the kitchen are? Would love it if you could provide the color for me. Thank you! 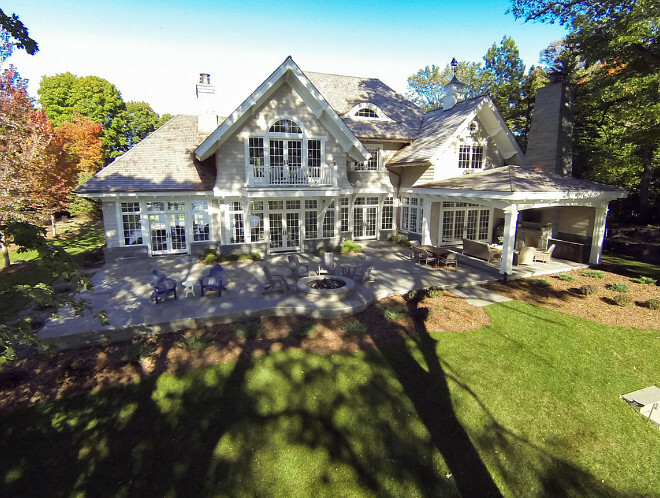 What a stunning home, inside and out! I am installing an outdoor kitchen under a porch currently. Are the cabinets that flank the fireplace custom? Has any further photos or floor plan been released on this home yet?